Platelet-activating factor acetylhydrolase 1B (PAF-AH) inactivates the potent phospholipid platelet-activating factor (PAF) and is composed of two catalytic subunits (α1 and α2) and a dimeric regulatory subunit, LIS1. The function of the catalytic subunits in brain development remains unknown. Here we examined their effects on proliferation in the ganglionic eminences and tangential migration. In α1 and α2 catalytic subunits knockout mice we noticed an increase in the size of the ganglionic eminences resulting from increased proliferation of GABAergic neurons. Our results indicate that the catalytic subunits act as negative regulators of the Wnt signaling pathway. Overexpression of each of the PAF-AH catalytic subunits reduced the amount of nuclear beta-catenin and provoked a shift of this protein from the nucleus to the cytoplasm. In the double mutant mice, Wnt signaling increased in the ganglionic eminences and in the dorsal part of the cerebral cortex. In situ hybridization revealed increased and expanded expression of a downstream target of the Wnt pathway (Cyclin D1), and of upstream Wnt components (Tcf4, Tcf3 and Wnt7B). Furthermore, the interneurons in the cerebral cortex were more numerous and in a more advanced position. Transplantation assays revealed a non-cell autonomous component to this phenotype, which may be explained in part by increased and expanded expression of Sdf1 and Netrin-1. Our findings strongly suggest that PAF-AH catalytic subunits modulate the Wnt pathway in restricted areas of the developing cerebral cortex. We hypothesize that modulation of the Wnt pathway is the evolutionary conserved activity of the PAF-AH catalytic subunits. The proper functioning of the cerebral cortex relies on formation of neural networks that are composed of excitatory neurons and inhibitory interneurons (reviewed by Wonders and Anderson 2006 ). The excitatory, or projection, neurons are born in proliferating zones of the cerebral cortex, the ventricular zone and the subventricular zone (rNoctor et al., 2004 ; eview Gotz and Huttner, 2005 ). These neurons usually migrate along radial glia to their proper cortical layer (reviews by Hatten, 2002 ; Ayala et al., 2007 ). The majority of interneurons, which compose approximately 20% of cortical neurons, are born in the ganglionic eminences (GE) and migrate to the cortex using a tangential mode of migration (reviews by Marin and Rubenstein, 2001 ; Metin et al., 2006 ). Following their arrival to the cerebral cortex, the interneurons utilize radial migration to reach the proper laminar position and then they intercalate in the network. Gamma-aminobutyric acid (GABA)-biosynthesizing enzymes preferentially localize to cortical interneurons, which are also known as GABAergic neurons. In the adult mammalian brain, GABA has been associated primarily with the mediation of synaptic inhibition. Imbalance between inhibition and excitation may underlie diseases such as epilepsy (reviewed by Ben-Ari, 2006 ). Cortical interneurons have also been implicated in developmental processes, including the regulation of neuronal proliferation and migration during corticogenesis and the development of cortical circuitry (reviews by Owens and Kriegstein, 2002 ; Spitzer, 2006 ). Identification of molecules and pathways, which regulate the number and migration of GABAergic neurons, is of clear importance when aiming to understand the normal and diseased brain. Platelet-activating factor-acetyl hydrolaze (PAF-AH) hydrolyzes PAF, an important lipid second messenger. PAF mediates an array of biological processes and is very abundant in the mammalian central nervous system, where it acts as a synaptic messenger, a transcription inducer and is involved in long-term potentiation, a cellular model of memory formation (Kato et al., 1994 ; Bazan, 1995 ). PAF deacetylation by PAFAH leads to its inactivation. The PAFAH1B intracellular enzyme is a tetramer composed of two catalytic subunits, α1 (PAFAH1B3) and α2 (PAFAH1B2), and a regulatory dimer of LIS1 (PAFAH1B1) (Hanahan, 1986 ; Kornecki and Ehrlich, 1988 ; Koltai et al., 1991 ; Chao and Olson, 1993 ; Stafforini et al., 2003 ; Bazan, 2005 ). From here forth PAFAH-1B will be referred to as PAF-AH. Deletions or point mutations in the LIS1 (Lissencephaly-1) gene are manifested in humans in a spectrum of abnormal neuronal migration phenotypes ranging between classical lissencephaly and subcortical band heterotopia in humans (Reiner et al., 1993 ; Barkovich et al., 2005 ). Impaired neuronal migration has been noticed also in mouse genetic models (Hirotsune et al., 1998 ; Cahana et al., 2001 ; McManus et al., 2004b ). Further reduction of LIS1 levels using in utero electroporation or conditional knock-out results in further impairment of neuronal migration as well as affects the proliferation of progenitors (Shu et al., 2004 ; Tsai et al., 2005 ; Tsai et al., 2007 ; Hebbar et al., 2008 ; Yingling et al., 2008 ). LIS1 dosage is crucial for proper brain development an increased levels of LIS1 affect brain development in human and in mice (Bi et al., 2009 ). Increased LIS1 levels affect the organization of the ventricular zone and impaired radial and tangential neuronal migration. Platelet-activating factor-acetyl hydrolaze catalytic subunits knockout mice were generated independently by two groups (Koizumi et al., 2003 ; Yan et al., 2003 ). Deletions of only the α2 subunit or both the α1/α2 subunits resulted in severe male infertility. No brain phenotype has been reported for these knockout mice. We further investigated these mice (Koizumi et al., 2003 ) and detected a moderate increase in the size of the ganglionic eminences. In parallel, we noted that overexpression of the PAF-AH catalytic subunits modulated the Wnt pathway in transfected cells. Conversely, in the double knockout mice Wnt signaling was enhanced. An additional effect on tangential migration was noted: the interneurons in the cerebral cortex were more numerous and in a more advanced position, which was accompanied with earlier development of thalamocortical fibers. Our findings strongly suggest that PAF-AH catalytic subunits modulate the Wnt pathway in restricted areas of the developing cerebral cortex. The experiments described in this manuscript were approved by the Weizmann Institute IACUC. The expression construct of pDsRedα1 was generated using rat α1 tagged with green fluorescent protein (GFP) digested with EcoR1 and NotI. The insert was cloned between Xho1 and SmaI with the EcoR1–Xho1 adaptors (5′-TCGAGCTACCTGCGGTG-3’ and 5′-AATTCACCGCAGGTAGC-3′) into pDsRed-C1 vector (Clontech, CA, USA). The corresponding Rat α2 tagged with GFP was digested with EcoR1 and Kpn1 and cloned between Xho1 and Kpn1 using the same adaptors and vector as described above. pcDNA3-Flagα1 and pcDNA3-Flagα2 expression vectors were generated by subcloning the same fragments into pcDNA3 tagged with a Flag epitope. Cloning was verified by DNA sequence analysis of the plasmids, and Western blot analysis of the transfected expression plasmids in mammalian cells. A plasmid that contains the 3′ UTR of the α1 was generated using a clone isolated from mouse brain cDNA library, inserted into pBS following PstI digestion. pcDNA3-Mycα1 plasmid was received from Prof. Junken Aoki. All GFP-β-catenin constructs, pTOPFLASH-Luc and pFOPFLASH-Luc were kindly provided by Prof. Avri Ben-Ze’ev. pCIG-CA-β-catenin plasmid was a gift from Prof. Andrew P. McMahon (Megason and McMahon, 2002 ). Flag-Dvl construct was a kind gift from Prof. Marianne Bienz (Schwarz-Romond et al., 2005 ). pTLHA-CRMP1 was provided by Prof. Erich E. Wanker (Stelzl et al., 2005 ) and pCDNA-HA-TLE1 was received from Prof. Yoram Groner (Levanon et al., 1998 ). CXCL12 (Sdf-1), inserted into pCMV-SPORT6 vector, was a gift from Prof. John L.R. Rubenstein. pBSc-α2 and Cyclin D1, Tcf3, Tcf4 and Wnt7B in pFLCI vectors, were provided by the Forchheimer plasmid collection. Monoclonal antibodies specific for Myc (SC-40) and HA (16B12) were purchased from Santa Cruz, CA, USA, and Convance CA, USA, respectively. Mouse monoclonal anti-Flag (M2), polyclonal antibodies specific for β-catenin and Goat anti-mouse-tubulin (DM1A) were purchased from Sigma (Rehovot, Israel). Mouse monoclonal antibodies for pY489-β-catenin were obtained from the developmental studies hybridoma bank (DSHB). Rabbit polyclonal antibodies for Calbindin were purchased from SWANT (Bellinzona, Switzerland). Polyclonal antibodies specific for Cyclin D1 were purchased from Abcam Cambridge, UK. TAG-1 antibodies were received from Prof. Peles (Horresh et al., 2008 ). Secondary antibodies used for immunostaining included Cy3- and Cy5-conjugated donkey anti-mouse and anti-rabbit IgG (H + L), and Cy3-conjugated Goat anti-mouse IgM purchased from Jackson ImmunoResearch. COS-7 and HEK293 were grown at 37°C, 5% CO2 in DMEM (Gibco, Auckland, New Zealand) supplemented with 10% fetal bovine serum (FBS), 4 mM glutamine, 100 U/ml penicillin and 0.1 mg/ml streptomycin. The single KO PAF-AH catalytic subunit mice were received from Prof. Hiroyki Arai (Koizumi et al., 2003 ) and were bred to generate the double KO mice. Prof. Yuchio Yanagawa kindly provided the GAD67-GFP (Δneo) mice (Tamamaki et al., 2003 ). Mice were raised in the Weizmann Institute of Science transgenic facility. Staging of embryos were according to defined developmental stages (Kaufman, 1992 ). The GAD67-GFP mice were bred with the double KO mice to create triple transgenic mice. COS-7 Cells were transfected using JET PEI (Polyplus-transfection, NY, USA). HEK293 cells were transfected by the calcium phosphate precipitation method (Graham and van der Eb, 1973 ). Lef/Tcf reporter assays were performed as previously described (Brembeck et al., 2004 ). Briefly, HEK293 cells were trypsinized 1 day prior to transfection and plated on 24 well plates. Cells were co- transfected with 0.25 μg of pTOPFLASH-Luc or pFOPFLASH-Luc, either 0.5 μg of pCIG-CA-β-catenin or Dvl expression constructs, and either TLE1 or CRMP1, respectively and also with different combinations of either PAF-AH α1 or α2. Empty pcDNA3 was added to keep the plasmid amounts equal in each transfection. Luciferase activity was determined 48 hr after transfection and normalized against β-galactosidase activity. Reporter assays were performed as triple transfections. COS-7 cells were grown on coverslips (Menzel-Glaser, Braunschweig, Germany). Two days after transfection, cells were washed in PBS (Gibco, Auckland, New Zealand), fixed with 3% paraformaldehyde and permeabilized using 0.1% Triton X-100. After blocking three times in PBS supplemented with 0.1% BSA (Sigma, Rehovot, Israel), coverslips were incubated with the indicated antibodies, stained with DAPI, mounted with Immu-mount (Thermo Electron Corporation, USA) and examined using the DeltaVision system (Applied Precision, Issaquah, WA, USA). E13.5 wild-type, heterozygote (α1+/−α2+/−), or double KO (α1−/−α2−/−) embryos were fixed in 4% paraformaldehyde overnight. The post-fixed embryos were washed three times with PBS and brains were dissected out. The brains were then embedded in 3.5% low-temperature melting point agarose. Coronal sections (60 μm) were cut using a vibratome (Leica) and collected floating in PBS. Sections were permeabilized with PBS-T (1 × PBS, 0.1% Triton X-100), blocked in 10% FCS/PBS-T and then incubated overnight at 4°C with the indicated antibodies. Slides were washed with PBS-T and incubated with secondary antibodies for 1 h RT, washed with PBS-T and mounted using Aqua Poly/Mount (Polysciences. Inc., USA). E13.5 embryos (wild-type C57BL/6J, Heterozygote for α1 and α2 (α1+/−α2+/−), or double KO (α1−/−α2−/−) were collected in ice-cold PBS in a RNase-free environment, then fixed in 4% paraformaldehyde overnight. Isolated brains were gradually dehydrated to 100% methanol and stored at −20°C. After bleaching with 1:5 H2O2:methanol, the brains were rehydrated and treated with Proteinase K, then brains were re-fixed and sectioned using a Leica vibratome (150 μm). Antisense digoxigenin-labeled RNA templates were generated by in vitro transcription using PCR products (using the appropriate combinations of T7, T3, and SP6 primers) from the corresponding genes. Hybridization was conducted overnight at 60°C, using the riboprobes at a concentration of 1 ng/μl in hybridization buffer [50% formamide (Ambion, Israel), 1.3% SSC, 0.2% Tween-20, 5 mM EDTA, 50 μg/ml yeast tRNA, 100 μg/ml Heparin (Sigma, Israel)]. Immunological detection was done using anti-digoxigenin-AP-conjugate antibodies (Roche, Germany) and NBT/BCIP reagents (Boehringer, Germany). E13.5 GAD67-GFP, wild-type and double KO brains were cut into 250 μm coronal slices and then transferred onto inserts (MilliCell-CM, Millipore) floating on serum free medium (Neurobasal medium supplemented with B27, N2, GlutaMax, glucose, and gentamicin). MGE explants, dissected from E13.5 GAD67-GFP brains, were loaded into a glass micropipette and transplanted into either wild-type or double KO E13.5 MGE. After 24 h of incubation at 37°C, 5% CO2, grafted neurons were visualized using the DeltaVision system package. Each time-lapse movie lasted 3 h with one frame taken every 2 min. To examine thalamocortical projections, fixed brains (E13.5) were labeled with DiI crystals (1,1′-dioctadecyl-3,3,3′,3′-tetramethylindocarbocyanine perchlorate (‘DiI’; DiIC18(3)) *crystalline*, Molecular probes). The crystals were placed within the thalamus and were left to diffuse for 5 days prior to vibratome sectioning (60 μm) that were later imaged using standard fluorescent microscopy. Images were taken using either the DeltaVision system package (Applied Precision, Issaquah, WA, USA), or confocal microscopy (LSM510, Zeiss). Cell counts and neuronal migration speed were analyzed using the MeasurementPro and ImarisTrack modules of Imaris software (Bitplane, Zurich, Switzerland). Area was measured using Adobe Photoshop CS2. Statistical analysis was conducted using Prism 4 for Macintosh (GraphPad Software, Inc.). Analysis of the brains of double mutant embryos (E13.5), revealed a modest increase in the size of the ganglionic eminences (GE). The area of the GE and number of cells at M-phase were determined by anti-phosphohistone H3 (pH3) immunostaining (Figures 1 A,B). Double KO mice had a significant (P = 0.0068) 34 ± 9.4% increase (112600 ± 7579 pixels, n = 8) in the area of pH3 positive cells in comparison with the heterozygotes (83860 ± 2371 pixels, n = 10). In addition, double KO mice exhibited a 26 ± 7.4% increase in the number of pH3 positive cells (336.4 ± 18.9, n = 8, P = 0.0029) in comparison with the heterozygotes (266.9 ± 9.3, n = 10). When we examined the number of pH3 positive cells in the cerebral cortex there was no difference between the double KO and the heterozygotes, thus suggesting an area specific effect of the mutation. When E12.5 embryos were examined, the area of the proliferation zone in the GE was only slightly and not significantly increased (+4.8%). There was no difference in the number of pH3 positive cells, therefore we focused our studies on E13.5 embryos. Figure 1. Double KO mice exhibited increased GE area where the PAF-AH catalytic subunit genes are expressed. (A,B) Sections from E13.5 double KO (A) or control mice (B) were immunostained with anti-pH3. The area of the proliferating zone was marked (black line), and the cells were counted. There were more pH3 positive cells in the double KO mice. (C,D) In situ hybridization was conducted at E13.5 using PAF-AH α1 (C) or α2 (D) probes. Scale bar is 1 mm. (E,F) High magnification of (C) and (D), respectively. Scale bar is 0.5 mm. Next, we examined whether the PAF-AH subunits are expressed at this developmental stage in the mouse embryonic brain. In situ hybridization showed that both the α1 and the α2 PAF-AH subunits are expressed in the GE as well as in other brain regions such as the developing cerebral cortex and the thalamus (Figures 1 C–F). Embryonic expression of the PAF-AH catalytic subunits has been previously noted in the mouse and rat brain (Albrecht et al., 1996 ; Manya et al., 1998 ). Our results suggest that the increased number of proliferating cells in the GE observed in double KO at E13.5 may be associated with the lack of expression of PAF-AH catalytic subunits. The Wnt pathway participates in the regulation of neuronal proliferation in the ganglionic eminences (Gulacsi and Anderson, 2008 ). Furthermore, high throughput protein-interaction data suggested possible interactions of the PAF-AH 1B3 (α1) catalytic subunit with several proteins related to the Wnt pathway (Kim et al., 2003 ; Daniels and Weis, 2005 ; Stelzl et al., 2005 ). A schematic presentation of the suggested position of PAF-AH within the Wnt pathway is shown in Figure 2 . Figure 2. Positioning of PAH-AH in the Wnt pathway. 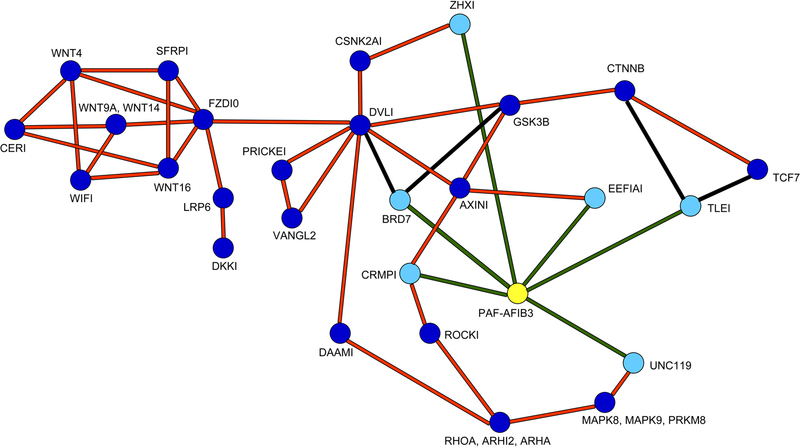 PAF-AH (highlighted in yellow) interacting proteins (highlighted in light blue) connected with green lines were detected in a large yeast two hybrid screen, additional interactions are connected by orange lines (Stelzl et al., 2005 ) and associated site: http://141.80.164.19/y2h_network/ppi_search.php (enter official gene symbol: pafah1b3). The BRD7 interactions were added from (Kim et al., 2003 ), and the interactions between CTNNB, TLE1 or TCF proteins were taken from (Daniels and Weis, 2005 ), these are marked with black lines. As can be seen in the scheme, PAF-AH interacts with multiple components both up and downstream to the canonical Wnt pathway. Although we verified some of the physical interactions in transfected cells using co-immunoprecipitation assays (CRMP1, BRD7 and UNC119, data not shown), we still could not predict how modulation of PAF-AH subunits will affect Wnt-mediated signaling in regard to modulating upstream and/or downstream processes. To test the possible effect of the PAF-AH subunits on the Wnt pathway we conducted cell-based luciferase reporter assays (Figure 3 ). Activation of the Wnt pathway stabilizes β-catenin allowing its entry to the nucleus, thereby activates transcription of genes containing TCF/LEF1 binding sites (Eastman and Grosschedl, 1999 ). The activation can be induced by addition of a constitutively active (CA) form of β-catenin or by addition of a Disheveled (Dvl) protein. HEK293 cells were co-transfected with either TOPFLASH (positive reporter plasmid with three copies of TCF/LEF-1 binding sites) or FOPFLASH (negative control with mutated binding sites) reporters, along with either CA β-catenin or Dvl (Figures 3 A,B, respectively). Overexpression of CA β-catenin or Dvl resulted in a significant increase in reporter gene activity (P < 0.001). However, when either CRMP1 or TLE1 were co-expressed with Dvl or CA β-catenin, respectively, the increase was significantly smaller (P < 0.01). A more pronounced reduction in the reporter activity was accomplished when either PAF-AH α1 or α2 proteins were expressed together with either CRMP1 or TLE1 (P < 0.001). Nonetheless, it is important to note that a significant reduction in CA β-catenin- or Dvl-mediated activation was obtained only when either α1 or α2 were co- expressed with these Wnt pathway activators (P < 0.001, ANOVA statistical analysis of luciferase assays with Tukey’s multiple comparison test, n = 3). Our results verified that CRMP1 and TLE1 are negative regulators of the Wnt signaling pathway as previously reported (Levanon et al., 1998 ; Stelzl et al., 2005 ). More importantly, our results demonstrated that the addition of either PAF-AH catalytic subunits α1 or α2 even without the addition of either CRMP1 or TLE1, repressed gene expression mediated by TCF/LEF1 binding sites. Figure 3. PAFAH α1 and α2 catalytic subunits repress TCF/LEF-dependent transcription induced by CA β-catenin (A) or disheveled (Dvl) (B). HEK293 cells were transfected with either TOPFLASH, a reporter vector for the activation of the Wnt signaling, or FOPFLASH, a negative control reporter. In addition, different combinations of α1 and α2 on top of either TLE1 (A), or CRMP1 (B). Results are normalized as fold of induction relative to basal luciferase activity. Histograms represent the mean of three experiments ± S.E.M. Stars indicate the p values: **P < 0.01, ***P < 0.001. In summary, expression of either PAF-AH catalytic subunit resulted in a decrease in activation of the Wnt-mediated reporter either following activation with CA β-catenin or following activation of the pathway using Dvl. The intracellular localization of GFP-tagged CA β-catenin was used as an additional mean to monitor activation of the Wnt pathway. In transfected COS-7 cells CA β-catenin is typically found as puncta in the cell nucleus (Figure 4 A 92.3 ± 6.2% of the transfected cells) similar to previous reports (Simcha et al., 1998 ; Giannini et al., 2000 ). However, the intracellular localization of CA β-catenin shifted to a prominent cytoplasmic localization following transfection with either PAF-AH α1 subunit, where only 35.4 ± 2% of the transfected cells showed nuclear localization (Figures 4 B,C) or PAF-AH α2 subunit, where 28.5 ± 2.8% of the transfected cells showed nuclear localization (Figures 4 D,E). In the presence of both subunits a smaller proportion of cells exhibited nuclear localization of CA β-catenin (Figures 4 F,G 26.2 ± 6.7% of the cells exhibited nuclear localization). The reduction in the percentage of cells exhibiting nuclear β-catenin is statistically significant for all treatments (ANOVA analysis with Dunnett’s multiple comparison test, P < 0.01, n = 3 experiments, 30 cells were quantified for each transfection in each experiment). Figure 4. PAFAH subunits affect subcellular localization of GFP-CA β-catenin. COS-7 cells were transfected with GFP-CA β-catenin (A) alone or together with DsRedα1 (B,C) or DsRedα2 (D,E), or both PAF-AH catalytic subunits (F,G). Cells were fixed 48 h after transfection and nuclear DNA was stained with DAPI (shown in blue). Overexpression of GFP-CA β-catenin demonstrated nuclear localization (A), whereas the addition of either DsRedα1 (C) or DsRedα2 (E) or both (G) shifted β-catenin to the cytoplasm (B,D,F). Scale bars are 20 μm. The apparent intracellular localization was also verified by cellular fractionation followed by Western blot analysis. Following addition of either PAH-AH α1 or α2 subunit there was a noticeable decrease in the proportion of nuclear β-catenin (data not shown). Interestingly, the catalytic subunits of PAF-AH were found in the nuclear as well as in the cytoplasmic fraction. In vivo we noticed a dramatic expansion in the area expressing nuclear β-catenin, which was most pronounced in the mantle layer of the lateral cortex (Figure 5 ). There was an almost two fold increase in the number of cells exhibiting nuclear β-catenin staining in the double KO brains in comparison with control sections (192 ± 34% versus 100 ± 7.6%, n = 4, P = 0.04). Figure 5. Double KO brain sections exhibit an increased area of nuclear β-catenin. Double KO (A–C) exhibit more cells with nuclear β-catenin in comparison with control (B–F). The white boxes define the higher magnifications areas. Scale bars: (A,D) 200, (B,E) 100, (C,F) 40 μm. Next, we examined the expression pattern of additional components of the Wnt pathway using in situ hybridization (Figure 6 ). The expression pattern of Cyclin D1, a downstream target of the Wnt pathway, was increased and expanded in the double KO versus the control mice (Figures 6 A,B). Figure 6. Double KO brains exhibit increased and expanded expression of downstream and upstream components of the Wnt pathway using in situ hybridization. (A,B) Expression of Cyclin D1 in double KO (A) or control (B). Note the expansion in the area expressing Cyclin D1 in the GE. (C,D) Expression of Tcf4 in double KO (C) or control (D). Arrowheads mark the comparable GE area, as well as cerebral cortex area (E,F) Expression of Tcf3 in double KO (E) or control (F). Note the mutually exclusive pattern of expression between the Tcf3 and Tcf4. (G,H) Expression of Wnt7B in double KO (G) or control (H). The area that expressed high levels of nuclear β-catenin is marked with arrowheads. Scale bars are 0.5 mm. Tcf4 and Tcf3 are members of the T cell factor/Lymphocyte enhancer factor family of transcription factors. Following activation of the Wnt pathway, β-catenin, alone or in association with members of the Tcf/Lef1, can translocate to the nucleus, where it ultimately controls the activity of specific target genes. We noticed an expansion in the expression domains of Tcf4 (Figures 6 C,D) and of Tcf3 (Figures 6 E,F). It is interesting to note that for the most, the expression pattern of Tcf4 and Tcf3 were mutually exclusive. In addition, a striking increase in Wnt7B expression was noticed mainly in the lateral cerebral cortex where we have previously noted an increase in nuclear β-catenin (Figures 6 G,H, arrowhead). Collectively, our data indicate that the double KO mice exhibit increased and expanded expression of upstream and downstream Wnt-pathway components. The development of the thalamocortical projection depends on the early tangential migration of a population of neurons derived from the ventral telencephalon (Lopez-Bendito et al., 2006 ). Therefore, we decided to examine whether the double KO mice exhibit any changes in the development of thalamocortical projections. We used TAG-1 immunostaining to visualize the emergence of the corticofugal system in the developing cortex (Denaxa et al., 2001 , 2005 ). 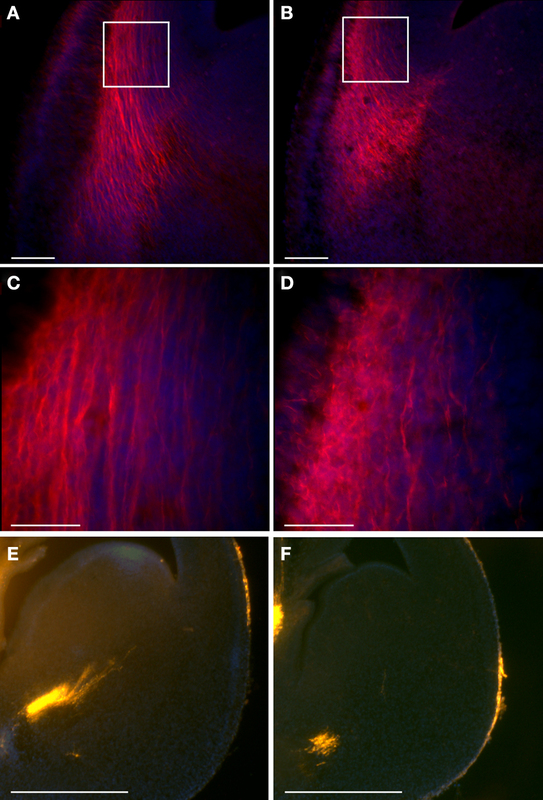 Immunohistochemical staining of cortical sections of E13.5 mouse embryos revealed the presence of labeled cells and their axons in the region of the plexiform primordium in wild-type mice (Figures 7 B,D). In the double mutant mice, intense TAG-1 immunoreactivity was present in fibers of the intermediate zone, the cortical plate as well as the marginal zone of the basolateral cortex (Figures 7 A,C). In addition, the labeling of thalamocortical fibers by DiI revealed an early development of thalamocortical projections in the double KO brains (Figure 7 E versus F). Figure 7. Double KO mice exhibit earlier thalamocortical projections. (A–D) TAG-1 immunostaining of double KO (A,C) and control (B,D) mice. Scale bars: (A,B) – 100; (C,D) – 40 μm. The white boxes in (A) and (B) define the area shown in (C) and (D). (E,F) DiI stained thalamocortical fibers exhibit earlier projections in double KO brains (E) in comparison to the control brains (F). Scale bars are 500 μm. The migration of interneurons from the ganglionic eminences towards the cortex was visualized by using fluorescent-based genetic labeling of these cells. We crossed GAD67-GFP knock-in mice (Tamamaki et al., 2003 ) with the double KO mice. An observable enhancement in interneuron migration to the cortex was noted following elimination of the PAF-AH catalytic subunits (Figures 8 A,B versus C,D). These results were corroborated by an observable increase in the number and relative position of calbindin positive interneurons found in the cerebral cortex in the double KO in comparison with the control (Figures 8 E,F versus G,H). Figure 8. Double KO mice exhibit advanced tangential migration. (A–D) GAD67-GFP-labeled interneurons are found in more advanced positions in double KO brain sections (A,B) in comparison with control sections (C,D). Scale bars in (A) and (C) is 100 μm, and in (B) and (D) is 40 μm. (E,F) Calbindin immunostaining, which identifies a subgroup of interneurons, demonstrates advanced positioning of these interneurons in the double KO (E,F) versus control (G,H). Scale bars in (E) and (G) is 100 μm, and in (F) and (H) is 40 μm. (I,J) Sdf-1 expression by in situ hybridization is expanded in the cortex of double KO (I) versus the control cortex (J). 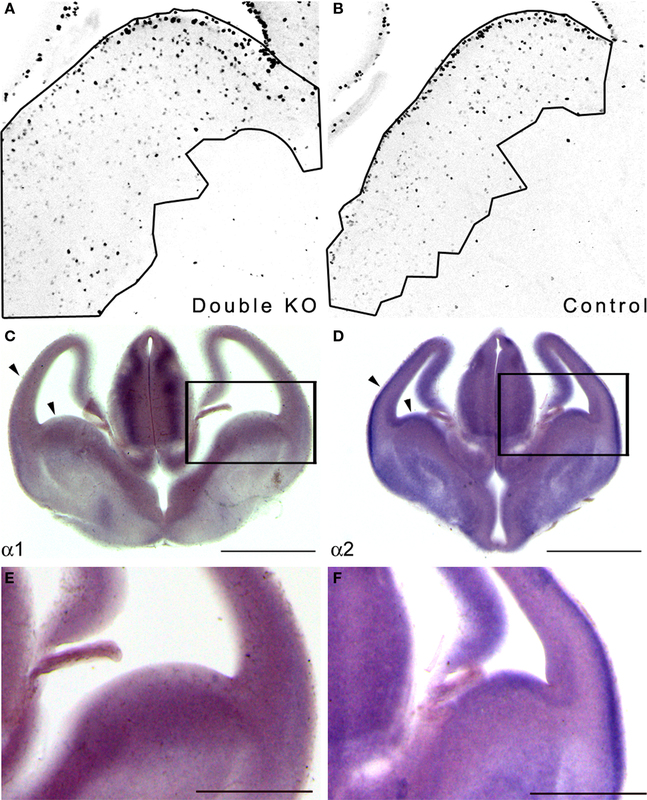 (K,L) In situ hybridization of Netrin-1 reveals an expanded expression in the striatum of double KO (K) versus the control striatum (L). Scale bars in (I–L) are 0.5 mm. Next, we monitored neuronal migration by time-lapse movies of neurons. Explants of GAD67-GFP MGE neurons, transplanted on either a wild-type or double knockout substrate, were time-lapsed 24 h after transplantation. GFP-labeled interneurons moved faster on the double knockout slice (20.8 ± 0.6 μm/h n = 4816, versus 14.4 ± 0.4 μm/h n = 7016, P < 0.0001, using unpaired t-test with Welch’s correction). The mean and instantaneous velocities of the interneurons fit with previously published results (Tanaka et al., 2003 ). These results suggested that the enhanced motility of the interneurons on the double KO substrate may result from a non-cell autonomous phenotype. One secreted protein, which has shown to affect migration of interneurons within this area is SDF-1 (stromal cell-derived factor-1) (Stumm et al., 2003 ). There was a clear difference in the pattern of Sdf-1 expression in the cortex; in the double KO it extended from lateral to medial aspect of cortical anlage (Figure 8 I) in comparison to the normal expression pattern seen in control brains (Figure 8 J). Next, we examined the expression pattern of Netrin-1, which has been shown to affect the migration of interneurons (Stanco et al., 2009 ). We detected increased expression of Netrin-1 in the striatum and lateral part of the cerebral cortex in comparison with the expression observed in control brains (Figures 8 K,L). Collectively, our data indicate that the double KO mice exhibit earlier arrival of thalamocortical fibers, enhanced and faster migration of interneurons to the cortex, which is in part non-cell autonomous. Our study revealed an unexpected activity of the PAF-AH catalytic subunits acting as negative regulators of the Wnt pathway. In addition, deletion of the PAF-AH catalytic subunits increases the proliferation of GABAergic neurons in the ganglionic eminences and affects their migration. The advanced migration of GABAergic neurons is in part a non-cell autonomous effect which may be mediated through the modified expression of Wnts, SDF1 and Netrin1 in the double KO embryos. Increased expression of the PAF-AH subunits repressed gene expression mediated by TCF/LEF1 binding sites following activation with CA β-catenin or following activation of the pathway using Dvl. Subsequent to expression of PAF-AH catalytic subunits, β-catenin was mainly retained in the cytoplasm in a cultured cell line. Conversely, genetic elimination of the PAF-AH catalytic subunits resulted in an increase in the number of cells expressing nuclear β-catenin, increased proliferation in the GE and increased and expanded expression of upstream and downstream Wnt pathway components. It may be of particular interest to repress the Wnt pathway, which is one of the five major signaling pathways predominating early and late embryonic development (Gerhart, 1999 ; Nusse, 1999 ). The Wnt pathway participates in multiple roles as diverse as embryonic segmentation and patterning, gut patterning, nervous system development, formation and patterning of appendages, and stem cell proliferation. Most of the current information involves Wnt signaling through stabilization of β-catenin, which in turn enters the nucleus and controls gene expression (Nelson and Nusse, 2004 ). The Wnt pathway is highly conserved in evolution (Brown et al., 2008 ; Croce and McClay, 2008 ). We hypothesize that the evolutionary conserved function of the PAF-AH catalytic subunits is modulation of the Wnt pathway and not their interaction with LIS1 that acts as cytoplasmic dynein regulator (for review see Reiner, 2000 ). We are basing this hypothesis on several important observations. On one hand, Lis1 heterozygote mice exhibit inhibition in radial and tangential migration (Hirotsune et al., 1998 ; Cahana et al., 2001 ; McManus et al., 2004b ). On the other hand, PAF-AH catalytic subunit KO mice, do not exhibit a cortical phenotype, although they have decreased levels of the LIS1 protein (Koizumi et al., 2003 ; Yan et al., 2003 ). Dosage sensitivity of the LIS1 protein is well established. Reduced or increased LIS1 levels exhibit brain phenotypes in mice and in human (Hirotsune et al., 1998 ; Cahana et al., 2001 ; Reiner et al., 2002 ; Bi et al., 2009 ). Therefore, the finding that PAF-AH catalytic subunit KO mice do not exhibit a cortical phenotype despite the apparent reduction in LIS1 levels was surprising. A possible explanation may be that the reduction in the LIS1 protein levels is just the portion of LIS1, which is required for interaction with the catalytic subunits, and the remaining amount of LIS1 required for other intracellular interactions is normal. An additional argument relates to the evolutionary conservation of the PAF-AH catalytic subunits. We have characterized the fly orthologs of the PAF-AH complex. The Drosophila alpha-subunit ortholog lacks two of the three active-site residues and is catalytically inactive against PAF-AH 1B substrates. The beta-subunit (LIS1) ortholog is highly conserved from Drosophila to mammals and is able to interact with the mammalian alpha-subunits but is unable to interact with the Drosophila alpha-subunit (Sheffield et al., 2000 ). It will be interesting to investigate the possibility that the Drosophila alpha-subunit can modulate the Wnt pathway. Canonical Wnt signaling mediated by β-catenin has been proposed to function in both neural progenitor cell expansion and neuronal lineage choice (Chenn and Walsh, 2002 ; Chenn and Walsh, 2003 ; Zechner et al., 2003 ; Hirabayashi et al., 2004 ; Israsena et al., 2004 ; Wrobel et al., 2007 ). The outcome of modulating the Wnt pathway is highly dependent on the brain area and the involvement of other factors (such as FGF2) (Israsena et al., 2004 ). Furthermore, some of the above mentioned studies used expression of stabilized β-catenin, which is not responsive to normal regulatory mechanisms. Within the medial GE, targeted deletion of β-catenin specifically impaired proliferation without grossly altering differentiation. The phenotype observed there was primarily due to loss of canonical Wnt signaling (Gulacsi and Anderson, 2008 ). Thus, it may be expected that increased Wnt signaling within the GE will result in increased proliferation as noticed in our studies. We observed that the double KO mice exhibited increased proliferation in the GE, earlier development of thalamocortical fibers and enhanced and faster migration of interneurons to the cortex, which is in part non-cell autonomous. These phenotypes may be due to activation of the Wnt pathway, nevertheless, we cannot exclude the participation or crosstalk with additional signaling pathways. The phenotypes observed in the PAF-AH double KO mice resemble in part phenotypes of Robo1-deficient mice. 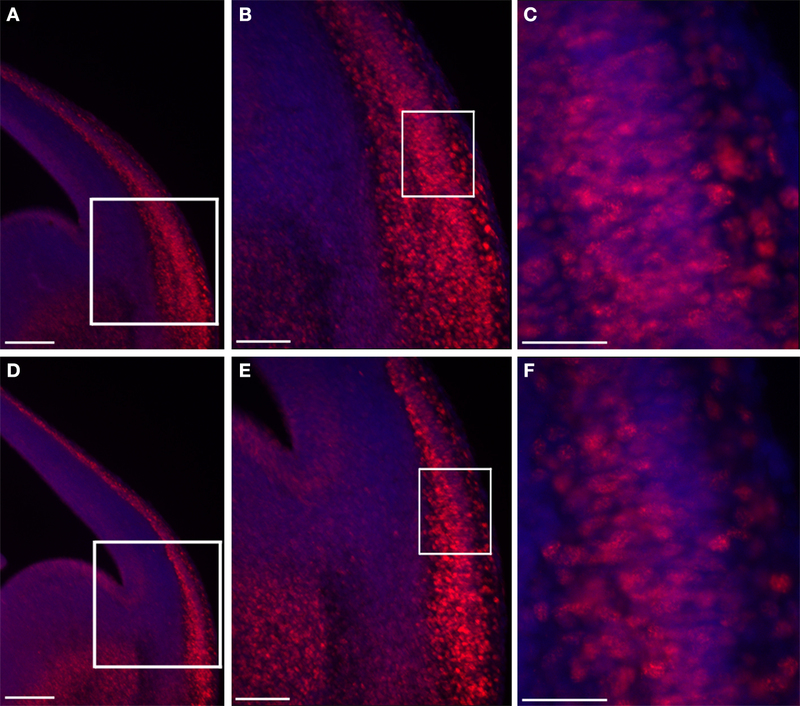 Robo1-KO mice exhibited an increased number of interneurons that was due to increased proliferation. A similar increase in proliferation was observed in Slit1(−/−)/Slit2(−/−) mutant mice, suggesting that cell division was influenced by Slit-Robo signaling mechanisms (Andrews et al., 2008 ). In addition, the sonic hedgehog (Shh) pathway participates in proliferation regulation in the GE (Xu et al., 2005 ; Fuccillo et al., 2006 ; Gulacsi and Anderson, 2006 ). It will be interesting to examine the possible involvement of the Slit-Robo and Shh signaling in regulation of the phenotypes observed in the PAF-AH double KO mice. Furthermore, in Robo1-deficient mice more interneurons migrated into the cortex (Andrews et al., 2006 ). It has been postulated that it was due to migration of the interneurons along the corticothalamic and thalamocortical axons that arrived earlier to their respective targets in the mutant than in the control (Andrews et al., 2006 ). In the PAF-AH double KO mice we observed earlier arrival of the thalamocortical axons identified by TAG-1 immunostaining. It is known that early born (E11.5–E14.5) GABAergic cells colocalize with TAG-1-positive axons in vivo, whereas later-born cells colocalized with TAG-1-negative fibers, suggesting temporal differences in substrate specificity (McManus et al., 2004a ). Thus, for the embryonic day we examined (E13.5) TAG-1 should be a good marker for progression of GABAergic cells. In addition, we examined directly the position of the interneurons using GAD67-GFP knock-in mice. The GFP positive interneurons were found in more advanced positions in the PAF-AH double KO mice. When we transplanted wild-type GAD67-GFP interneurons on double KO or wild-type substrates we noticed faster motility on the mutant background. These results suggest a non-cell autonomous activity, which may be attributed to multiple known secreted factors. To date, multiple guidance molecules have been identified (for examples see Lopez-Bendito et al., 2008 ; Marin and Rubenstein, 2001 ). In our study, we examined three secreted factors; Netrin-1, Sdf-1 and Wnt7B. Netrin-1 was shown to interact with alpha3beta1 integrin to promote interneuronal migration (Stanco et al., 2009 ). However, Netrin-1 activity is known to be context dependent and can act as either a chemoattractant or a chemorepellent (Alcantara et al., 2000 ; Charron et al., 2003 ; Wilson and Key, 2006 ). Netrin-1 expression in the striatum acts as a repulsive factor (Hamasaki et al., 2001 ). Thus, increased expression of Netrin-1 in the striatum of double KO may be involved in promoting interneuron migration to the cortex. In addition, Netrin-1 expression may also influence thalamocortical projections (Powell et al., 2008 ). SDF-1 regulates migration and positioning of CXCR4-expressing interneurons during cortical development (Stumm et al., 2003 ; Liapi et al., 2008 ). Furthermore, localized expression of SDF-1 can induce chemotaxis in migrating neurons and alter their local trajectories (Liapi et al., 2008 ). The expanded and increased expression of Sdf-1 in mice lacking PAF-AH catalytic subunits may explain in part the change in the migration rates observed in these mice. In addition, we noted increased and expanded expression of Wnt7B. To the best of our knowledge, there are no direct data suggesting for a role of this Wnt family member in regulation of interneuron migration. Nevertheless, the Wnt pathway participates in regulation of cell migration in a very diverse system which is the movement of groups of cells forming the lateral line primordium of the zebrafish (Aman and Piotrowski, 2008 ). In that system, Wnt/β-catenin works in conjunction with FGF signaling to regulate the expression of SDF-1 chemokine receptors. Thus, despite the long list of known secreted factors guiding and regulating interneuron migration, additional factors may be added. We suggest that possible modulation of the Wnt pathway by the PAF-AH catalytic subunits attenuates interneuron migration to the cerebral cortex. We thank the following scientists for kindly providing reagents: Profs. Yuchio Yanagawa (Gunma University Graduate School of Medicine, Japan), Hiroyki Arai (University of Tokyo, Japan), Junken Aoki (Tohoku University, Japan), Andrew P. McMahon (Harvard University, USA), Marianne Bienz (MRC Laboratory of Molecular Biology, UK), Erich E. Wanker (Max-Delbrück Center for Molecular Medicine, Germany), John L.R. Rubenstein (University of California at San Francisco, USA), Amos Simon (Tel-Hashomer, Israel) and Avri Ben-Ze’ev, Yoram Groner, and Elior Peles (Weizmann Institute of Science, Israel). We thank Nataly Shvartzman and Yonatan Demeshko for help in genotyping, and Judith Chermesh, Shosh Grossfeld, and Yehuda Melamed from the Veterinary Resources for technical assistance. This research has been supported in part by research grants from the March of Dimes, #6-FY07-388, the Legacy Heritage Biomedical Program of the Israel Science Foundation (grant no. 1062/08), the Benoziyo Center for Neurological Diseases, the Nehemias Gorin foundation, a research grant from Marla Schaefer and the estate of Lela London. Albrecht, U., Abu-Issa, R., Ratz, B., Hattori, M., Aoki, J., Arai, H., Inoue, K., and Eichele, G. (1996). Platelet-activating factor acetylhydrolase expression and activity suggest a link between neuronal migration and platelet-activating factor. Dev. Biol. 180, 579–593. Alcantara, S., Ruiz, M., De Castro, F., Soriano, E., and Sotelo, C. (2000). Netrin 1 acts as an attractive or as a repulsive cue for distinct migrating neurons during the development of the cerebellar system. Development 127, 1359–1372. Aman, A., and Piotrowski, T. (2008). Wnt/beta-catenin and Fgf signaling control collective cell migration by restricting chemokine receptor expression. Dev. Cell 15, 749–761. Andrews, W., Barber, M., Hernadez-Miranda, L. R., Xian, J., Rakic, S., Sundaresan, V., Rabbitts, T. H., Pannell, R., Rabbitts, P., Thompson, H., Erskine, L., Murakami, F., and Parnavelas, J. G. (2008). The role of Slit-Robo signaling in the generation, migration and morphological differentiation of cortical interneurons. Dev. Biol. 313, 648–658. Andrews, W., Liapi, A., Plachez, C., Camurri, L., Zhang, J., Mori, S., Murakami, F., Parnavelas, J. G., Sundaresan, V., and Richards, L. J. (2006). Robo1 regulates the development of major axon tracts and interneuron migration in the forebrain. Development 133, 2243–2252. Ayala, R., Shu, T., and Tsai, L. H. (2007). Trekking across the brain: the journey of neuronal migration. Cell 128, 29–43. Barkovich, A. J., Kuzniecky, R. I., Jackson, G. D., Guerrini, R., and Dobyns, W. B. (2005). A developmental and genetic classification for malformations of cortical development. Neurology 65, 1873–1887. Bazan, N. G. (1995). Inflammation. A signal terminator. Nature 374, 501–502. Bazan, N. G. (2005). Lipid signaling in neural plasticity, brain repair, and neuroprotection. Mol. Neurobiol. 32, 89–103. Ben-Ari, Y. (2006). Seizures beget seizures: the quest for GABA as a key player. Crit. Rev. Neurobiol. 18, 135–144. Bi, W., Sapir, T., Shchelochkov, O. A., Zhang, F., Withers, M. A., Hunter, J. V., Levy, T., Shinder, V., Peiffer, D. A., Gunderson, K. L., Nezarati, M. M., Shotts, V. A., Amato, S. S., Savage, S. K., Harris, D. J., Day-Salvatore, D. L., Horner, M., Lu, X. Y., Sahoo, T., Yanagawa, Y., Beaudet, A. L., Cheung, S. W., Martinez, S., Lupski, J. R., and Reiner, O. (2009). Increased LIS1 expression affects human and mouse brain development. Nat. Genet. 41, 168–177. Brembeck, F. H., Schwarz-Romond, T., Bakkers, J., Wilhelm, S., Hammerschmidt, M., and Birchmeier, W. (2004). Essential role of BCL9-2 in the switch between beta-catenin’s adhesive and transcriptional functions. Genes Dev. 18, 2225–2230. Brown, F. D., Prendergast, A., and Swalla, B. J. (2008). Man is but a worm: chordate origins. Genesis 46, 605–613. Cahana, A., Escamez, T., Nowakowski, R. S., Hayes, N. L., Giacobini, M., von Holst, A., Shmueli, O., Sapir, T., McConnell, S. K., Wurst, W., Martinez, S., and Reiner, O. (2001). Targeted mutagenesis of Lis1 disrupts cortical development and LIS1 homodimerization. Proc. Natl. Acad. Sci. USA 98, 6429–6434. Chao, W., and Olson, M. S. (1993). Platelet-activating factor: receptors and signal transduction. Biochem. J. 292, 617–629. Charron, F., Stein, E., Jeong, J., McMahon, A. P., and Tessier-Lavigne, M. (2003). The morphogen sonic hedgehog is an axonal chemoattractant that collaborates with netrin-1 in midline axon guidance. Cell 113, 11–23. Chenn, A., and Walsh, C. A. (2002). Regulation of cerebral cortical size by control of cell cycle exit in neural precursors. Science 297, 365–369. Chenn, A., and Walsh, C. A. (2003). 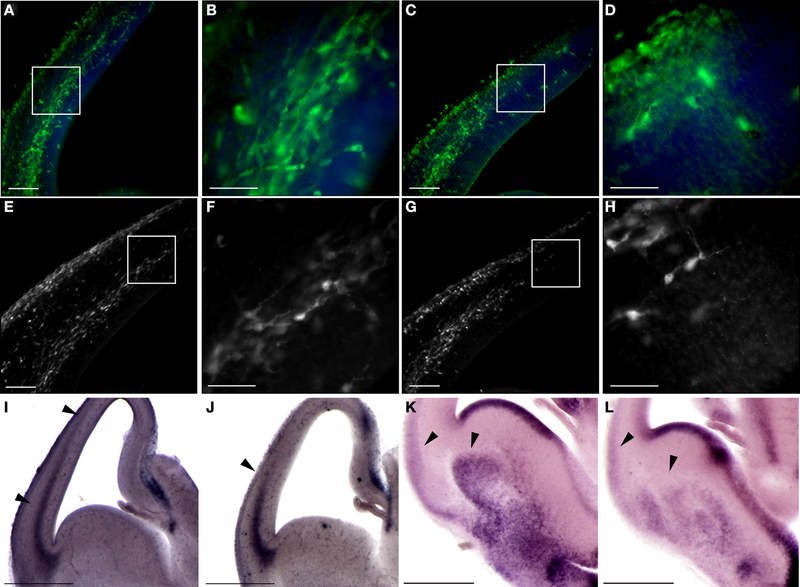 Increased neuronal production, enlarged forebrains and cytoarchitectural distortions in beta-catenin overexpressing transgenic mice. Cereb. Cortex 13, 599–606. Croce, J. C., and McClay, D. R. (2008). Evolution of the Wnt pathways. Methods Mol. Biol. 469, 3–18. Daniels, D. L., and Weis, W. I. (2005). Beta-catenin directly displaces Groucho/TLE repressors from Tcf/Lef in Wnt-mediated transcription activation. Nat. Struct. Mol. Biol. 12, 364–371. Denaxa, M., Chan, C. H., Schachner, M., Parnavelas, J. G., and Karagogeos, D. (2001). The adhesion molecule TAG-1 mediates the migration of cortical interneurons from the ganglionic eminence along the corticofugal fiber system. Development 128, 4635–4644. Denaxa, M., Kyriakopoulou, K., Theodorakis, K., Trichas, G., Vidaki, M., Takeda, Y., Watanabe, K., and Karagogeos, D. (2005). The adhesion molecule TAG-1 is required for proper migration of the superficial migratory stream in the medulla but not of cortical interneurons. Dev. Biol. 288, 87–99. Eastman, Q., and Grosschedl, R. (1999). Regulation of LEF-1/TCF transcription factors by Wnt and other signals. Curr. Opin. Cell Biol. 11, 233–240. Fuccillo, M., Joyner, A. L., and Fishell, G. (2006). Morphogen to mitogen: the multiple roles of hedgehog signalling in vertebrate neural development. Nat. Rev. Neurosci. 7, 772–783. Gerhart, J. (1999). 1998 Warkany lecture: signaling pathways in development. Teratology 60, 226–239. Giannini, A. L., Vivanco, M. M., and Kypta, R. M. (2000). Analysis of beta-catenin aggregation and localization using GFP fusion proteins: nuclear import of alpha-catenin by the beta-catenin/Tcf complex. Exp. Cell Res. 255, 207–220. Gotz, M., and Huttner, W. B. (2005). The cell biology of neurogenesis. Nat. Rev. Mol. Cell Biol. 6, 777–788. Graham, F. L., and van der Eb, A. J. (1973). Transformation of rat cells by DNA of human adenovirus 5. Virology 54, 536–539. Gulacsi, A., and Anderson, S. A. (2006). Shh maintains Nkx2.1 in the MGE by a Gli3-independent mechanism. Cereb Cortex 16 (Suppl 1), i89–i95. Gulacsi, A. A., and Anderson, S. A. (2008). Beta-catenin-mediated Wnt signaling regulates neurogenesis in the ventral telencephalon. Nat. Neurosci. 11, 1383–1391. Hamasaki, T., Goto, S., Nishikawa, S., and Ushio, Y. (2001). A role of netrin-1 in the formation of the subcortical structure striatum: repulsive action on the migration of late-born striatal neurons. J. Neurosci. 21, 4272–4280. Hanahan, D. J. (1986). Platelet activating factor: a biologically active phosphoglyceride. Ann. Rev. Biochem. 55, 483–509. Hatten, M. E. (2002). New directions in neuronal migration. Science 297, 1660–1663. Hebbar, S., Mesngon, M. T., Guillotte, A. M., Desai, B., Ayala, R., and Smith, D. S. (2008). Lis1 and Ndel1 influence the timing of nuclear envelope breakdown in neural stem cells. J. Cell Biol. 182, 1063–1071. Hirabayashi, Y., Itoh, Y., Tabata, H., Nakajima, K., Akiyama, T., Masuyama, N., and Gotoh, Y. (2004). The Wnt/beta-catenin pathway directs neuronal differentiation of cortical neural precursor cells. Development 131, 2791–2801. Hirotsune, S., Fleck, M. W., Gambello, M. J., Bix, G. J., Chen, A., Clark, G. D., Ledbetter, D. H., McBain, C. J., and Wynshaw-Boris, A. (1998). Graded reduction of Pafah1b1 (Lis1) activity results in neuronal migration defects and early embryonic lethality. Nat. Genet. 19, 333–339. Horresh, I., Poliak, S., Grant, S., Bredt, D., Rasband, M. N., and Peles, E. (2008). Multiple molecular interactions determine the clustering of Caspr2 and Kv1 channels in myelinated axons. J. Neurosci. 28, 14213–14222. Israsena, N., Hu, M., Fu, W., Kan, L., and Kessler, J. A. (2004). The presence of FGF2 signaling determines whether beta-catenin exerts effects on proliferation or neuronal differentiation of neural stem cells. Dev. Biol. 268, 220–231. Kato, K., Clark, G. D., Bazan, N. G., and Zorumski, C. F. (1994). Platelet-activating factor as a potential retrograde messenger in CA1 hippocampal long-term potentiation. Nature 367, 175–179. Kaufman, M. H. (1992). The Atlas of Mouse Development. London: Academic Press Limited. Kim, S., Lee, J., Park, J., and Chung, J. (2003). BP75, bromodomain- containing M(r) 75,000 protein, binds dishevelled-1 and enhances Wnt signaling by inactivating glycogen synthase kinase-3 beta. Cancer Res. 63, 4792–4795. Koizumi, H., Yamaguchi, N., Hattori, M., Ishikawa, T. O., Aoki, J., Taketo, M. M., Inoue, K., and Arai, H. (2003). 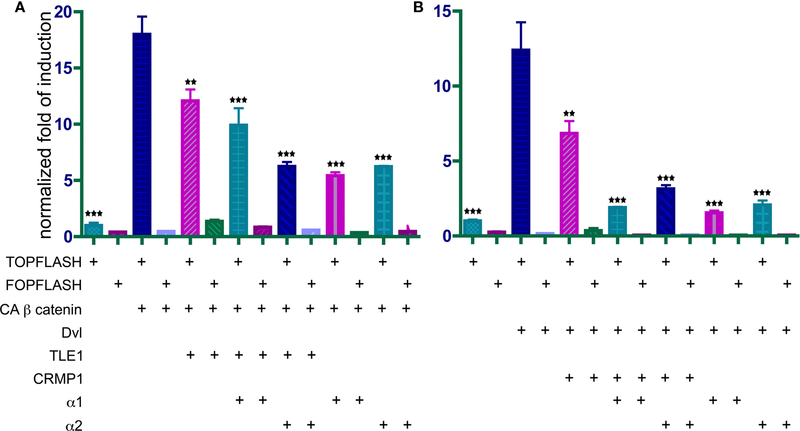 Targeted disruption of intracellular type I platelet activating factor-acetylhydrolase catalytic subunits causes severe impairment in spermatogenesis. J. Biol. Chem. 278, 12489–12494. Koltai, M., Hosford, D., Guinot, P., Esanu, A., and Braquet, P. (1991). Platelet activating factor (PAF). A review of its effects, antagonists and possible future clinical implications (Part I). Drugs 42, 9–29. Kornecki, E., and Ehrlich, Y. H. (1988). Neuroregulatory and neuropathological actions of the ether-phospholipid platelet-activating factor. Science 240, 1792–1794. Levanon, D., Goldstein, R. E., Bernstein, Y., Tang, H., Goldenberg, D., Stifani, S., Paroush, Z., and Groner, Y. (1998). Transcriptional repression by AML1 and LEF-1 is mediated by the TLE/Groucho corepressors. Proc. Natl. Acad. Sci. USA 95, 11590–11595. Liapi, A., Pritchett, J., Jones, O., Fujii, N., Parnavelas, J. G., and Nadarajah, B. (2008). Stromal-derived factor 1 signalling regulates radial and tangential migration in the developing cerebral cortex. Dev. Neurosci. 30, 117–131. Lopez-Bendito, G., Cautinat, A., Sanchez, J. A., Bielle, F., Flames, N., Garratt, A. N., Talmage, D. A., Role, L. W., Charnay, P., Marin, O., and Garel, S. (2006). Tangential neuronal migration controls axon guidance: a role for neuregulin-1 in thalamocortical axon navigation. Cell 125, 127–142. Lopez-Bendito, G., Sanchez-Alcaniz, J. A., Pla, R., Borrell, V., Pico, E., Valdeolmillos, M., and Marin, O. (2008). Chemokine signaling controls intracortical migration and final distribution of GABAergic interneurons. J. Neurosci. 28, 1613–1624. Manya, H., Aoki, J., Watanabe, M., Adachi, T., Asou, H., Inoue, Y., Arai, H., and Inoue, K. (1998). Switching of platelet-activating factor acetylhydrolase catalytic subunits in developing rat brain. J. Biol. Chem. 273, 18567–18572. Marin, O., and Rubenstein, J. L. (2001). A long, remarkable journey: tangential migration in the telencephalon. Nat. Rev. Neurosci. 2, 780–790. McManus, M. F., Nasrallah, I. M., Gopal, P. P., Baek, W. S., and Golden, J. A. (2004a). Axon mediated interneuron migration. J. Neuropathol. Exp. Neurol. 63, 932–941. McManus, M. F., Nasrallah, I. M., Pancoast, M. M., Wynshaw-Boris, A., and Golden, J. A. (2004b). Lis1 is necessary for normal non-radial migration of inhibitory interneurons. Am. J. Pathol. 165, 775–784. Megason, S. G., and McMahon, A. P. (2002). A mitogen gradient of dorsal midline Wnts organizes growth in the CNS. Development 129, 2087–2098. Metin, C., Baudoin, J. P., Rakic, S., and Parnavelas, J. G. (2006). Cell and molecular mechanisms involved in the migration of cortical interneurons. Eur. J. Neurosci. 23, 894–900. Nelson, W. J., and Nusse, R. (2004). Convergence of Wnt, beta-catenin, and cadherin pathways. Science 303, 1483–1487. Noctor, S. C., Martinez-Cerdeno, V., Ivic, L., and Kriegstein, A. R. (2004). Cortical neurons arise in symmetric and asymmetric division zones and migrate through specific phases. Nat. Neurosci. 7, 136–144. Nusse, R. (1999). WNT targets. Repression and activation. Trends Genet. 15, 1–3. Owens, D. F., and Kriegstein, A. R. (2002). Is there more to GABA than synaptic inhibition? Nat. Rev. Neurosci. 3, 715–727. Powell, A. W., Sassa, T., Wu, Y., Tessier-Lavigne, M., and Polleux, F. (2008). 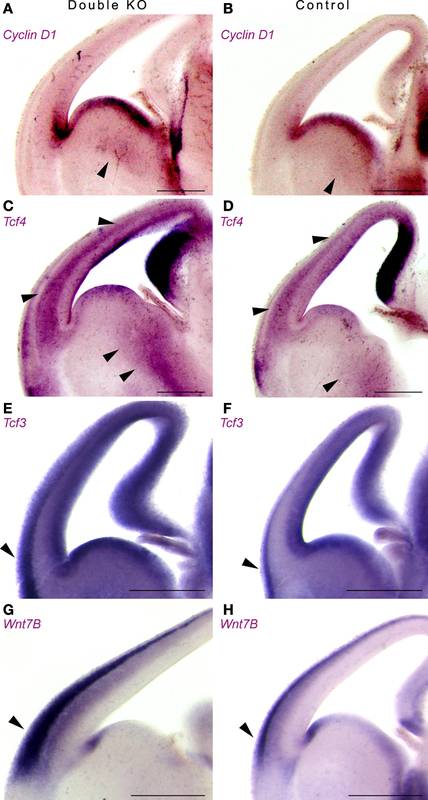 Topography of thalamic projections requires attractive and repulsive functions of Netrin-1 in the ventral telencephalon. PLoS Biol. 6, e116 doi:10.1371/journal.pbio.0060116. Reiner, O. (2000). LIS1: let’s interact sometimes (part 1). Neuron 28, 633–636. Reiner, O., Cahana, A., Escamez, T., and Martinez, S. (2002). LIS1-no more no less. Mol. Psychiatry 7, 12–16. Reiner, O., Carrozzo, R., Shen, Y., Wehnert, M., Faustinella, F., Dobyns, W. B., Caskey, C. T., and Ledbetter, D. H. (1993). Isolation of a Miller-Dieker lissencephaly gene containing G protein beta-subunit-like repeats. Nature 364, 717–721. Schwarz-Romond, T., Merrifield, C., Nichols, B. J., and Bienz, M. (2005). The Wnt signalling effector dishevelled forms dynamic protein assemblies rather than stable associations with cytoplasmic vesicles. J. Cell. Sci. 118, 5269–5277. Sheffield, P., Garrard, S., Caspi, M., Aoki, J., Inoue, K., Derewenda, U., Suter, B., Reiner, O., and Derewenda, Z. S. (2000). Homologues of the α- and β-subunits of mammalian brain platelet-activating factor acetylhydrolase Ib in the Drosophila melanogaster genome. Proteins 39, 1–8. Shu, T., Ayala, R., Nguyen, M. D., Xie, Z., Gleeson, J. G., and Tsai, L. H. (2004). Ndel1 operates in a common pathway with LIS1 and cytoplasmic dynein to regulate cortical neuronal positioning. Neuron 44, 263–277. Simcha, I., Shtutman, M., Salomon, D., Zhurinsky, J., Sadot, E., Geiger, B., and Ben-Ze’ev, A. (1998). Differential nuclear translocation and transactivation potential of beta-catenin and plakoglobin. J. Cell Biol. 141, 1433–1448. Spitzer, N. C. (2006). Electrical activity in early neuronal development. Nature 444, 707–712. Stafforini, D. M., McIntyre, T. M., Zimmerman, G. A., and Prescott, S. M. (2003). Platelet-activating factor, a pleiotrophic mediator of physiological and pathological processes. Crit. Rev. Clin. Lab. Sci. 40, 643–672. Stanco, A., Szekeres, C., Patel, N., Rao, S., Campbell, K., Kreidberg, J. A., Polleux, F., and Anton, E. S. (2009). Netrin-1-alpha3beta1 integrin interactions regulate the migration of interneurons through the cortical marginal zone. Proc. Natl. Acad. Sci. USA 106, 7595–7600. Stelzl, U., Worm, U., Lalowski, M., Haenig, C., Brembeck, F. H., Goehler, H., Stroedicke, M., Zenkner, M., Schoenherr, A., Koeppen, S., Timm, J., Mintzlaff, S., Abraham, C., Bock, N., Kietzmann, S., Goedde, A., Toksoz, E., Droege, A., Krobitsch, S., Korn, B., Birchmeier, W., Lehrach, H., and Wanker, E. E. (2005). A human protein-protein interaction network: a resource for annotating the proteome. Cell 122, 957–968. Stumm, R. K., Zhou, C., Ara, T., Lazarini, F., Dubois-Dalcq, M., Nagasawa, T., Hollt, V., and Schulz, S. (2003). CXCR4 regulates interneuron migration in the developing neocortex. J. Neurosci. 23, 5123–5130. Tamamaki, N., Yanagawa, Y., Tomioka, R., Miyazaki, J., Obata, K., and Kaneko, T. (2003). Green fluorescent protein expression and colocalization with calretinin, parvalbumin, and somatostatin in the GAD67-GFP knock-in mouse. J. Comp. Neurol. 467, 60–79. Tanaka, D., Nakaya, Y., Yanagawa, Y., Obata, K., and Murakami, F. (2003). Multimodal tangential migration of neocortical GABAergic neurons independent of GPI-anchored proteins. Development 130, 5803–5813. Tsai, J. W., Bremner, K. H., and Vallee, R. B. (2007). Dual subcellular roles for LIS1 and dynein in radial neuronal migration in live brain tissue. Nat. Neurosci. 10, 970–979. Tsai, J. W., Chen, Y., Kriegstein, A. R., and Vallee, R. B. (2005). LIS1 RNA interference blocks neural stem cell division, morphogenesis, and motility at multiple stages. J. Cell Biol. 170, 935–945. Wilson, N. H., and Key, B. (2006). Neogenin interacts with RGMa and netrin-1 to guide axons within the embryonic vertebrate forebrain. Dev. Biol. 296, 485–498. Wonders, C. P., and Anderson, S. A. (2006). The origin and specification of cortical interneurons. Nat. Rev. Neurosci. 7, 687–696. Wrobel, C. N., Mutch, C. A., Swaminathan, S., Taketo, M. M., and Chenn, A. (2007). Persistent expression of stabilized beta-catenin delays maturation of radial glial cells into intermediate progenitors. Dev. Biol. 309, 285–297. Xu, Q., Wonders, C. P., and Anderson, S. A. (2005). Sonic hedgehog maintains the identity of cortical interneuron progenitors in the ventral telencephalon. Development 132, 4987–4998. Yan, W., Assadi, A. H., Wynshaw-Boris, A., Eichele, G., Matzuk, M. M., and Clark, G. D. (2003). Previously uncharacterized roles of platelet-activating factor acetylhydrolase 1b complex in mouse spermatogenesis. Proc. Natl. Acad. Sci. USA 100, 7189–7194. Yingling, J., Youn, Y. H., Darling, D., Toyo-Oka, K., Pramparo, T., Hirotsune, S., and Wynshaw-Boris, A. (2008). Neuroepithelial stem cell proliferation requires LIS1 for precise spindle orientation and symmetric division. Cell 132, 474–486. Zechner, D., Fujita, Y., Hulsken, J., Muller, T., Walther, I., Taketo, M. M., Crenshaw, E. B., 3rd, Birchmeier, W., and Birchmeier, C. (2003). beta-Catenin signals regulate cell growth and the balance between progenitor cell expansion and differentiation in the nervous system. Dev. Biol. 258, 406–418. Copyright: © 2010 Livnat, Finkelshtein, Ghosh, Arai and Reiner. This is an open-access article subject to an exclusive license agreement between the authors and the Frontiers Research Foundation, which permits unrestricted use, distribution, and reproduction in any medium, provided the original authors and source are credited.